Basement floors can be a problem to live with and to finish if you have moisture problems. There are several ways of dealing with the moisture, including filling cracked basement floors, sealing the basement floors, using a dehumidifier and/or sump pump, and laying moisture barriers for basement floors — prior to installing your flooring choice. Sealing basement floors is very important. Although most people may think that it is unnecessary because there is carpet or other flooring covering it, sealing your concrete or cement basement floors can prevent mold and mildew from developing and can help your flooring to last longer. Basement floors are especially susceptible to moisture because they are underground and the concrete is directly touching the dirt. Unsealed concrete will act like a sponge and wick water into the basement, and this can cause various problems in your home, including mold, mildew. A large percentage of homes may have a water problem in their basement and the inhabitants may not even realize it! Mold, algae, and mildew growth can cause health problems for all the members of your family and can even cause death if a person is exposed to it for a long period of time. This is why it is of utmost importance to seal your basement floors to make sure that this will not be a factor in your home. How does water enter your basement? There are a few different ways. Cracked basement floors are one of the ways that water can get into your basement. Water can be moved into your basement through your concrete floors if they are not sealed. Humidity could also cause a moisture problem in your basement. The first thing to do is to make sure that as much water as possible is moved away from your home via French drains, gutters, grading, filling cracks, and drains. Dehumidifiers and sump pumps can be invaluable in some areas to further keep moisture at bay. Then you will be ready to learn how to seal basement floors and walls to keep your basement moisture, mildew, mold, and algae free. Seal your basement floors and walls to keep water from the ground soaking into the concrete. There are many different options for sealing basement floors. Read the instructions on the sealant that you choose to make sure that you know how to seal your basement floor and to ensure that it will work just as it is designed to. Applying the sealant as directed will help your floors to be dry and mold, mildew, and algae free for years. Sealing your basement floors will also help your flooring to last a long time. This way you will be able to put down any flooring that you choose without having to worry about it being damaged by moisture or water. There are also moisture barriers for basement floors that are available for use in addition to sealing the basement floors. Using both methods will allow you to have peace of mind in putting down your new flooring. If you are having moisture problems in your basement, you will want to take up the existing flooring to try to determine where the moisture is coming into your basement. If you have more than hairline cracks, then you will want to mix up some mortar to fill the cracks. Make sure that all cracks are filled before you seal the floor. If there are not any cracks, then moisture may be coming from the ground underneath your flooring. Applying a sealant will definitely help if this is the case. Sealing basement floors is a way to take care of your health by preventing mold, mildew, and algae and will help your flooring that you lay down over your concrete to last much longer. Keep the moisture and water away from your basement by sealing your concrete basement floors to help your health and your flooring budget! I just took up old linoleum in the basement to put down tile and water’s dampening the floor. It’s uniform throughout, making me think it’s being wicked up by unsealed concrete due to the high water table. I’ve waited 3 months and the rainy season never seems to end here. Can I just seal the floor while it’s damp or do I need to find a way to dry it? Without knowing the cause of the moisture a professional should be consulted to determine how and if the moisture can be stopped. Hi, Can you tell me if sealing our basement with a moisture barrier sealant will also prevent radon gas from seeping through the concrete floor? Yes depending on the Sealant you chose to use. I would contact a professional in your area to discuss your options. I have a concrete floor. There was mold when I pulled the carpet. I am wanting to put laminate flooring back down. If I put down heavy plastic before I install the laminate will that keep possible mold from leaching through into my laminate. Thank you. 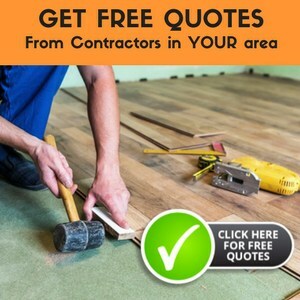 You will want to find out what is causing the mold before sealing or installing new flooring. I would contact a professional in your area to assess the moisture level and the best way to provide a subfloor. I know someone who is having problems concerning their concrete basement floor. It seems that when they paint the floor with concrete paint, it will eventually bubble and produce a white fiborous substance. What may be causing this reacction and what can be done to solve the problem? It sound like the fibrous substance could be efflorescence which is caused from moisture seeping up through the basement floor. The only way to keep it from happening is to address the moisture problem itself. Efflorescence damages the concrete (and it’s integrity). Hopefully, it’s not damaged to the point where you’d need to jackhammer the concrete and and pour a new basement – which is a very extreme scenario. You may need to have a professional come in and see if they can figure it out and advise your friends what to do! I would suggest that you contact a local contractor to assess the problem and offer a solution. It sounds as if you may have bigger water issues than have been addressed in the past. The musty smell is from the dampness, mold and mildew, this should improve as the basement is dried and cleaned. I was reading your comments…and the one that said..” sound like the fibrous substance could be efflorescence which is caused from moisture seeping up through the basement floor. The only way to keep it from happening is to address the moisture problem itself. ” what about using the product called radonseal which claims to seal your cement so that moisture cant get through it? I do not have experience with Radonseal, but it does sound as though it would seal appropriately against the moisture. We just bought our house not too long ago. We have noticed that this house has a musty smell throughout and can’t figure out where the smell is coming from. Sometimes that smell gets stronger. Can it be a result of dampness? How can we tell if we have a mold problem? Someone told us that there is water coming up the basement floor, which is covered by tiles, and that this is something that can’t be fixed. Can this be true? We don’t know what kind of professional can help with this. Any insight you can provide will be greatly appresicated. Is it normal, after applying a moisture seal, for it to bubble as it dries? This can definitely be the result of dampness. There are other things to look at besides the basement (although it is a possibility). There could be a drain leaking, a water pipe leaking, roof damage letting in moisture, many different things. If there is water coming up the basement, it should be able to be redone and sealed correctly. If you cannot find the source yourself, I would suggest contacting a general home inspector and letting them know of the problem, they may be able to assist you. Sealer will bubble from air getting underneath it as it dries. If the bubbles are bad they may crack open and need to be resealed. If they are small, they may dry correctly. I would keep an eye on them and make sure that they do dissolve during the drying process. Bought a house about a year ago that had some dampness issues in the basement that we have controlled with a dehumidifier. Yesterday i noticed water on the otherside of the basement seeping from a crack in the floor that leads from the drain from the upstairs basement. The water is coming from the 1st half of the crack only and flows into another floor drain. The crack extends about 15ft from the drain and Ys out another 3ft each side. Do you think it could be solved by mortaring up the crack & sealing it or do you think the problem is greater than that?